Jakarta – Solidarity Commitee for Nanbu Workers Struggle (KSPBN) held demonstrations protesting against work accident case and layoffs. The first action was held in front of PT Toyota Motor Manufacturing Indonesia (PT TMMIN) in Sunter, North Jakarta, on Sunday (April 8, 2018). The next action was conducted in 12 cities, namely, Jakarta, Bekasi, Jakarta, Bandung, Ternate, Morotai, Sula, Tobelo, Ambon, Kupang, Tarakan, Makassar, Manado, Yogyakarta, on the next day, Monday (April 9, 2018). This action is motivated by the case of work accident that occurred in Toyota’s subcontractor factory, PT. Nanbu Plastics Indonesia located in Industrial Area MM2100, Cibitung, Bekasi Regency. A female worker named Atika Nafitasari suffered a work accident on September 26, 2016. Her right middle finger was cut off while she was running a press machine. At the time of the accident, the company did not provide yet a social insurance card (BPJS Ketenagakerjaan) for Atika, but she had been working for 9 months at PT. Nanbu. Atika was finally able get the surgery after 19 hours because she had to wait for the company to provide the card. The piece of her finger that had been stored in the freezer, could not be reattached. After a year had passed, Atika’s scar was bleeding and festering in December 2017. The union, Serikat Buruh Bumi Manusia PT Nanbu Plastics Indonesia (SEBUMI PT NPI) asked PT NPI management to make Atika a permanent employee in the company as the responsibility for the work accident. The legal basis of it is in the Article 59 of Law no. 13/2003 on Manpower and the Regulation of Minister of Manpower (permenaker) 100/2004 on Provision of Work Agreement for a Specified Time (contract workers-ed). SEBUMI PT. NPI also demanded that 9 other contract workers to be appointed as the permanent employees with reference to Article 59 of the Labour Law and the Regulation of Minister of Manpower (permenaker) 100/2004. Negotiations between trade unions and employers were conducted three times on January 10, 2018, January 17, 2018 and January 19, 2018. However, the company was unwilling to make appointments to the workers. The labourers believe that the lawsuit is still reasonable for the number of contract labourers in Nanbu is not proper, which are 305 people from the 648 workers. The use of contract labour is limited to provisional jobs, Seasonal jobs, and Jobs related to new products, activities or additional products for no more than three years. “Nanbu has been standing for 8 years since 2010,” KSPBN wrote in a statement. SEBUMI PT NPI reported this case to Supervision Area II West Java on February 13, 2018. Atika’s case of work accident was also reported to BPJS Employment Bekasi on March 01, 2018. The union hopes that there can be parties who can be responsible for the treatment of Atika’s wound that still has not healed. But there was still no result. Finally, on March 8, 2018, SEBUMI PT. NPI marched a demonstration action in front of PT TMMIN (Toyota Indonesia) to convey the case of work accident that happened in PT Nanbu. The management of Nanbu attempt to prevent them by sending a letter of not permitting the action number 026/ NPI-HRD/II/2018 signed by Richard Sinanu on February 23, 2018. SEBUMI PT NPI still performed the action as planned. Workers were shooed off from factories under security escorts and civilian militias (thugs). Labour is only given 15 minutes to pack. Police were seen guarding in the factory neighborhood, along with the soldiers. The presence of soldiers in the factory is considered to violate Law no. 34 of 2004 on the Indonesian National Armed Forces (TNI). In response to the layoffs, as many as 33 workers declared that they refuse the layoffs and still wanted to work in the company. Entrepreneurs are deemed to have done union busting, obstructed the freedom of expression in public, deviated the using of contract workers and ignored victims of workplace accident. Most recently, the company also laid off a woman workers who was 6 months pregnant. In the banner, KSPBN declared “Toyota Japan “Re-colonises” Indonesia”. According to KSPBN coordinator, Samsi Mahmud, the Japanese capital expansionism in Indonesia was a fact that occurred for more than 40 years. “Since 1974, Japanese companies including Toyota have gained investment convenience under Suharto’s New Order regime. They include low labour costs and flexible labour status in the form of contract labour (PKWT), outsourcing and apprenticeship, “he said. As a result, the automotive industry in Indonesia is dominated by Japanese manufacturers. Japanese manufacturers control 96 percent of the automotive market share in Indonesia. In 2016, Toyota dominated the car sales market with sales of 238,795 units, Honda was in second position with 136,058 units. The next position was by Daihatsu with 116,999 units sale (it was actually owned by the Toyota Motor Corporation owner), Mitsubishi with 64,929 units sale, Suzuki with 61,176 units sale, Datsun 23,028 with units sale, Hino with 13,624 units sale, Nissan with 9,980 units sale and Isuzu with 10,041 units sale. Toyota and controls over 80 per cent of national automotive exports. Toyota’s production is sustained by 120,000 workers, including those in 798 supplier companies of tier 1, tier 2 and tier 3. Japanese capital stocking has massively exploited labourers. “This case of work accident is just icebergs from the various excesses of Japanese capital imprealism in Indonesia. Workers are given jobs, but to make companies richer. 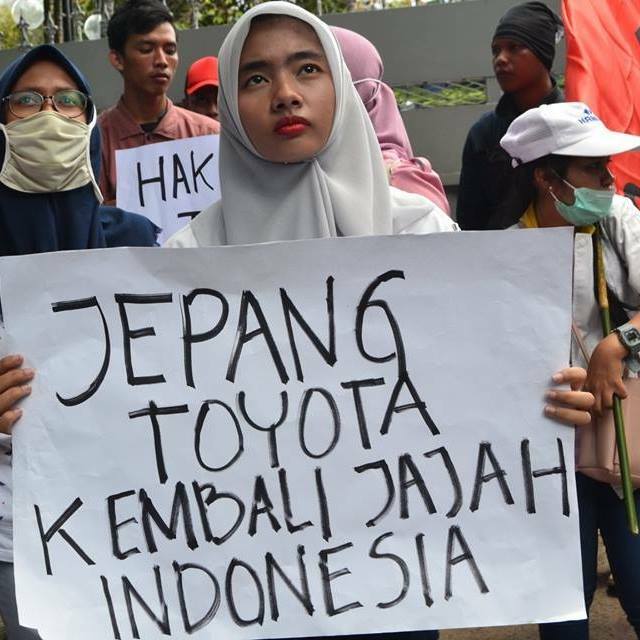 Toyota was able to have three factories in Indonesia, whereas workers are increasingly repaying the mortgage debt every month,” said one of orator. In a campaign on social media with tags #JepangToyotaKembaliMenjajahIndonesia, KSPBN reminded Malari incident in 1974. The Malari (Malapetaka 15 Januari) was a riot and the Japanese cars were burned off because of a sentiment towards foreign capital, especially Japanese capital. This event started with the students’ rejection of the arrival of Prime Minister (PM) of Japan Tanaka Kakuei.